Peter Mather and his partner Marty had spent a long time preparing to capture a photograph of the Porcupine caribou migrating through the crow flats of north western Canada. But, what they hadn’t accounted for was a plane fault which left them stranded 120km from their destination. This is Peter Mather’s story ‘In Pursuit’ where, travelling on two pairs of skis and carrying 700lbs of equipment, two conservationist photographers found themselves in a race against time to capture a photograph of the spectacular caribou migration before it was too late. For me, the Porcupine caribou are special. I grew up in the north western region of Canada known as the Yukon. 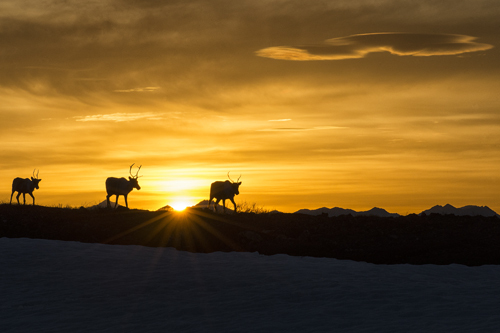 In the Yukon, everyone hears about the Porcupine caribou – they are larger than life. Every year, they migrate through the valleys of the crow flats in their thousands. 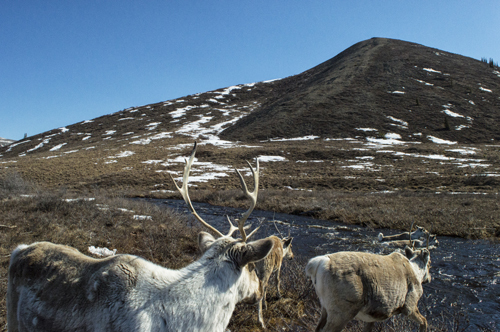 It is a spectacular annual event which showcases the power of the caribou and the teamwork they use to migrate through the vast, desolate landscapes that they inhabit. Recently however, the calving and nursing grounds of the caribou in Alaska’s ANWR (Arctic National Wildlife Refuge), has been opened up by the Trump Administration to industrial development. Human interference – thousands of helicopters, roads, pipelines and pump stations – have the potential to devastate the herd and badly affect the Gwich’in people whose subsistence lifestyle and culture are tied to the herd. On the back of our interest in Porcupine caribou and knowing of the threats they are facing, myself and my expedition partner Marty wanted to bring attention to the power and beauty of these animals, through our photographs. Our plan was capture a photo of the caribou migration, photographing the lead animal with a line of caribou leading down the mountain and across the valley floor. We wanted to give a sense of the number of caribou and the teamwork that they employ when moving in winter. So, we flew out to the Crow flats in north western Canada where we would set up a nice leisurely base camp and patiently wait for the 200,000 strong porcupine Caribou herd to pass through our location on their annual migration to their calving grounds. Although I am native to the Yukon, until this point, my expedition experience consisted of month long canoe trips in the middle of summer. 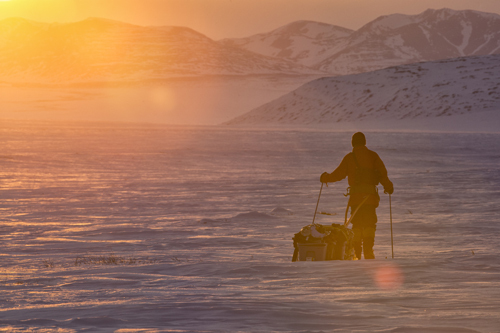 This was my first winter expedition and so I knew it required extensive planning. However, even after all the preparation we did in understanding conditions and speaking to experts, it wasn’t until we arrived that we became aware of the challenge which awaited us. A plane fault left us stranded 120km from our intended location. We had to quickly come to terms with the fact that although we had prepared for a base camp situation, we were suddenly faced with the most intense ski expedition of our lives. The intensity of the journey was quickly realised as we had to tackle difficulties from the start. 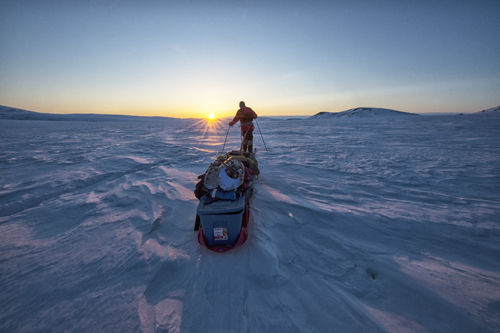 In the first three days of the expedition we only covered 13km out of the 120km required. On top of this we were already starting to feel the pain of skiing through the soft slushy snow. My partner Marty’s feet were essentially one large oversized blister, and for him, skiing was almost unbearable. In an effort to avoid tackling the conditions for another day, we came up with a solution to increase our efficiency across the snow. Skiing in the daytime had meant catching the snow when it was at its softest. We introduced a new night time schedule which would allow us to take full advantage of the cold hard snow crust that forms at night. Our efficiency improved dramatically and soon enough we were covering 10km per night. At this time of year, the night sky was a brilliant dark blue rather than completely black, so skiing at night was not a problem. At last, we were on the right tracks and we were hopeful we would arrive at Margaret lake in time to capture the photograph we wanted. As I skied side by side with Marty under the brilliant dark blue sky, I was relishing feeling like one of Gwich’in first nations people who travelled this route for centuries. Nevertheless, having to ski at maximum intensity everyday was becoming physically exhausting. It took every ounce of energy we had to keep going. We were just praying the snow wouldn’t break underneath us as we needed all the help we could get from the conditions in order to keep going. Aside from the skiing, spending the night in sub-zero temperatures also presented its challenges. Fortunately for us though, this was one aspect of the expedition of which we were fully prepared. In the build-up to the trip, we had been speaking with the most experienced ski trip expeditioner in the Yukon – Peter Heebink. He has been doing trips like this for 40 years and gave us advice which would never have known without him. For example, we took the unorthodox decision to forgo a tent in favour of a high-quality winter sleeping bag and mat on the back of his advice. Tents fill with condensation in winter and present a huge hassle without being very effective. Our sleeping bags on the other hand allowed us to sleep inside at plus 20 whilst the outside of the bag remained at minus 10. So, whilst the expedition was not the one we had prepared for, much of our preparation proved to be invaluable. 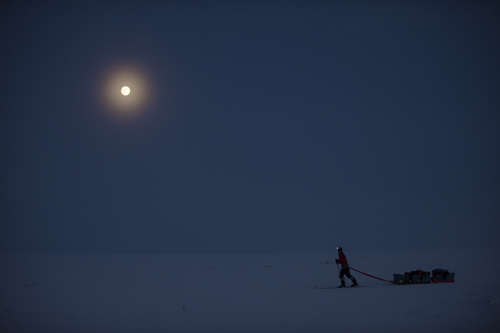 It was on the tenth day of our expedition after having pushed ourselves to our absolute limits that we heard the howls from the wolves. This was the signal we needed to learn we had arrived at our destination. It was at this point however, that we were notified by phone satellite that the caribou had in fact stopped migrating as soon as we got off the plane. It meant we would have to wait for the caribou anyway – our efforts to get to Margaret lake as quickly as possible had been for nothing. We had to spend the next week waiting in anticipation for the caribou to finally pass through. Having thought we were still on track for the perfect photo of the caribou, we were hit with another piece of bad luck. A sudden increase in temperature changed the winter scene completely, and with it, melted away our chances of capturing our dream photo. We were now effectively in summer conditions and photographing the caribou would mean photographing them in groups of 50, grazing on grass rather than in their thousands trailing down the mountain. After 3 years of preparation and the toughest ski expedition of our lives, we had failed to get the one photo we wanted. However, I didn’t find the disappointment hard to deal with. It is simply part of the process. I know that I may spend a month chasing a perfect caribou photo on skis and not get it, but I may be driving down a remote road a month later and get the best caribou photo of all time. Nevertheless, if you really want a photo, you have to do everything you can to make it a reality. After everything we went through, Marty and I have always looked back on this expedition with fondness and good memories. We are continually motivated by inspiring photography and great adventures. The great thing about what we do is that it is centred around conservation and so it gives our photography purpose. If we can create inspirational images, we can move people to act. It is for this reason that the desire to capture the perfect photo of the Porcupine caribou remains as strong as ever. I want the 200,000 strong Porcupine caribou herd to carry on migrating through these lands, now and for long after I live. The chase will always continue!